We decided to volunteer in the summer of 2018, but even though we’ve been friends forever, we couldn’t agree on what we wanted to do, nor where we wanted to go. We brainstormed many possible options, ranging from volunteering at a children’s nursery in Ghana to working with elephants in India. I wanted to focus on construction, whilst Niko preferred animal conservation, and so we agreed on Education. Fortunately for us, we came across Give a Fig Volunteering, a non-profit organization based in Sri Lanka. They were perfect for us; we could focus on education and construction, and they were flexible enough to enable us to incorporate turtle conservation during the last few days. This flexibility required organization and tailoring, which Give A Fig Volunteering were more than willing to do. Unlike most organizations that have their fixed itineraries, GAFV enable us to customize our volunteer experience, adapting it to our different interests and preferences. It’s definitely something that we both appreciated. With most organizations you would typically find yourself with unreasonable prices that didn’t specify where your money went. Give a Fig Volunteering was more transparent with the costs of volunteering, but more importantly, Give A Fig were significantly cheaper than other volunteering organisations we’d looked into. We read some reviews on their site which said this, and we certainly found it to be true. And they were a totally professional organisation. Paying less, didn’t mean getting less! We also funded the building of the double toilet, and we know by the receipts, that all of the money went on that project. Above all, GAFV were totally accommodating. 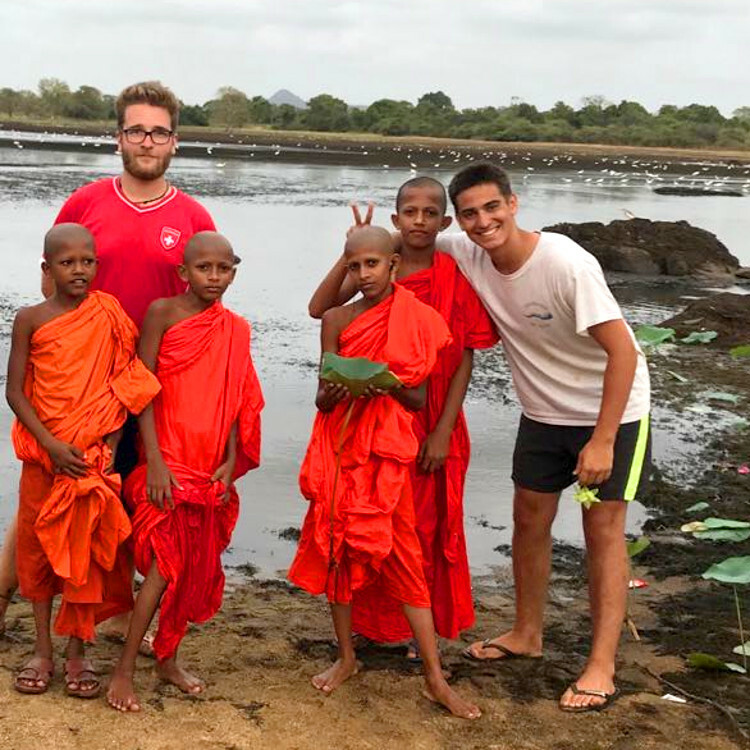 They are embedded in the Sri Lankan society, smoothing out the organization of our daily activities and enabling us to meet and actually get to know locals, whether they were monks, teachers, construction workers, and even the police. Their HQ is the accommodation, and doubles up as hostel – the Fig and Gecko – which supports the non-profit work, and it really did become ‘home’. The food was excellent, as were the beds, and the place is kept really clean. The four-day volunteering week was absolutely perfect. We thought we’d prefer to work 5 days, but actually, GAFV got the balance just right. We found that we had the energy to work hard for 4 days, and the 3 days a week to relax, recharge, and go on trips to see the amazing country. GAFV planned with us really well – and we came back each week with enthusiasm to carry on doing our best. GAFV would organize weekend trips to visit the beautiful natural and archeological sites in Sri Lanka. What I love about GAFV was that, not only do they stress the importance of volunteering but also encourage visiting touristic locations and becoming familiar with Sri Lankan culture. Many examples include taking part in ceremonies, visiting the monks’ village, making pots with local potters and going on a tractor ride to look for wildlife. The villagers were humble people that we learnt a lot from. GAFV advised on and planned all of our tourist stops in the country – and they did an amazing job, as they know so much about the country. We split our 4 week in Sri Lanka with 3 weeks volunteering and 1 week sightseeing, where we went on a great trip around the island. Paul and Jane organized a driver for us and recommended amzing places to go and see at all our stops. Overall, I would absolutely recommend this experience. This is an interview with Alice (with the tropical birds in the garden getting involved too) who joined us after her A levels in July 2017 prior to taking her place at the University of Oxford to study economics. We are very proud of what Alice had to say about us on her final day, and we hope that her interview may help you to decide what you are looking for in a volunteering non-profit. 'I’m Mark, the leader of a youth centre in Streatham south London, and this experience of volunteering was recommended to me by a fellow London youth leader, Stu Thomson, director of Knights' Youth Centre, who’d brought his young leaders out in 2016 on a construction project. We decided to come out on an education project, and it was fantastic. Mark and Sophie lining up with a primary class, the head teacher, and teachers for a group photo. We decided to come out on an education project, and it was fantastic. Although none of the young leaders aged 16-22 had taught before they all threw themselves into their roles in the primary, and the secondary, as well as in the college, and the monks’ school, and 2 orphanages. I always had faith in young people’s ability to excel, but what they achieved here in Sri Lanka with Give A Fig Volunteering was beyond all I could have imagined. They too far exceeded what they thought they could do; they loved it here. Them coming out of the classroom each day feeling proud, made me proud. ... and behind the monks and the volunteers, the 3rd highest man made structure of the ancient world, the first 2 being the Great Pyramids. We're really proud of our reviews, and we think that it's important that parents review our programmes too, and the experiences their child has with us. Check out this interview with Travis, one of our 2016 volunteers, featured in the Spring 2017'edition of Source magazine. I volunteered with a group of 7 others during my university vacation in 2016, and I had such an amazing time I’m hoping to lead a team back out here from my Uni in 2017. There really is something for everyone here volunteering with GAFV, and they organise it really well. Any hiccoughs, because they are there with us in Sri Lanka, are sorted out straight away, and never become a problem. The accommodation was really good, and the transport – we opted for a mini bus each day - was all arranged, which made life so much easier for us. This cost an extra £50 each per person for the 2 weeks' volunteering days, but it really was worth it. GAFV also organised a 2 day mini-tour for us to the beach and other sites on our days off, and were flexible with the programme, as on one work day we went to a local hotel – which was a fantastic place, with a great swimming pool. One of the things I really liked was that we worked a 4 day week, and so we had plenty of time to work and relax, without feeling too tired, because we did work hard. We were involved in an infrastructure project, but it could so easily have been about agriculture, organic agriculture, wildlife conservation, tree planting and reforestation, or education. We missed the herd of 100 elephants that live near the village, and the crocodiles, but we saw some amazing sites, natural, and archaeological – including dolphins, and elephants – on our tour. GAFV are clearly committed to the villagers they work with, as they got on really well with them all. We were welcomed by dancers, and had a great send off at the end, with a village meeting, presentation with a certificate, as well as participation in a Buddhist festival. I really loved the pottery, which we did at the temple. The potter and his family brought all of the clay to the temple where we were working and we had a go at this craft. Everything was really well thought out and designed to involve as many of the community, and provide as much work for the locals – who clearly have very little - as possible. This is something I’ll never forget. I still keep in touch with GAFV and follow them on FB, and I am amazed at the personal touch and time they put into working with us, and tailoring programmes for people. I promise you, you won’t get a better volunteering experience, or a better managed programme than with these guys. I’m sitting here looking at all my photos, and reminiscing about my time in Sri Lanka as I write this review, which Paul asked me if I'd be happy to write, and I am delighted to be able to do so. Volunteering with GAFV was honestly the most amazing experience ever, and I'm so grateful I got to do it! I went with 7 other youth leaders from a London youth organisation, and we had an amazing experience. We went on a village infrastructure development project. The village was in a rural area, and we worked at a temple, finishing off toilets, and improving the home of 13 young monks. GAFV organised everything for us, and did so really well. The accommodation was excellent, and they were on hand to support us every step of the way to ensure that everything went smoothly. We had an interpreter with us the whole time, who was from a local college, which was brilliant. She was really helpful and it demonstrated GAFV’s desire to support local young people get work – which she now has. We had an amazing time getting to know people and getting involved in their culture. We were greeted by dancers, and a welcome speech; we cooked with the locals, went to gather reeds and made baskets, had time making pots with a potter. We worked a four day week – which was brilliant, and good planning on GAFV’s part. We never got too tired – even though we worked hard - went swimming at the local 5* hotel, and on a 2 day tour to see elephants (we missed the herd by the village), and then dolphins and had a great time at the beach. All organised by GAFV. Well done guys! The most amazing thing, though, being youth workers, was spending time with the kids in the village after they’d finished school at 13:30, and with all the young monks. Those kids hold a special place in my heart and always will. I really do miss my time over there but I know I will 100% be back there to see them! Thank you to everyone who made it special and amazing and to Give a Fig Volunteering for a job really well done! Bhiksu University of Sri Lanka, Anuradhapura. We, the Bhiksu University of Sri Lanka, (http://busl.ac.lk/ ) the world’s only state funded University for Buddhist Monks situated in the UNESCO Ancient City of Anuradhapura, are very pleased to work with Give A Fig Volunteering. We were first introduced to them and their work by the provincial government’s Chief Minister’s office and private secretary, with whom we had been discussing English language education, and the great difficulties we have in giving our staff and students a real experience of working with English speakers. They recommended that I speak with the Director of Give a Fig Volunteering who is carrying out invaluable teaching and development work in the Anuradhapura area. We launched our first very successful collaborative English teaching programme for our Lecturers in June 2016. The teaching went very well, the Lecturers really enjoyed the lessons, and the Volunteers who worked there did an excellent job delivering English. We looked after the Volunteers very well, and we know that they had a fantastic time. Give A Fig’s work with us is greatly valued, and we are looking forward to many more collaborations, both inside and outside the lecture room to raise the English language skills of the university’s undergraduates and Lecturers – and your enjoyment of our hospitality and culture - as we move to teaching each of our subjects through English. We thoroughly recommend the professionalism and dedication of Give A Fig Volunteering, who are very supportive of us, as well as of all cultures and people. We look forward to welcoming you, their volunteers, to Sri Lanka, our University, and to experience our ancient culture. We will also give you a certificate from the university and Give A Fig Volunteering, as well as letters of commendation celebrating your English language work at the University, and cultural ambassadorial work with us, which will greatly enhance your CV. We are both retired teachers and volunteer organisers, and joined this Give A Fig programme for 1 month. Organised and arranged by Paul and Jane who lead Give A fig, they coordinated everything with the university, including our accommodation and food. We taught for 16 days over 20, and had 10 days holiday. The monks – the university lecturers – were a pleasure to work with, and we had an amazing time in this fabulous country. Nothing was too much trouble, we were treated very well, and supported throughout. I would thoroughly recommend volunteering with Give A Fig Volunteering; you’ll have an amazing time.